“The tattooed man stopped at the edge of the meadow and sat on a rock for a moment as he shook the old grass from his bearskin soled boots. After replacing with fresh grass and ensuring that it was evenly distributed around his feet, the man stood, gathering his bow, quiver, and snow shoes, which slung over his shoulders, and continued his trek. He needed to reach the village by nightfall. The grass would keep his feet warm and the new grass was needed since the deep snow covered any chance of grass in the highlands.Arriving at the village just as the sun dipped behind the mountain, no one dared approach to greet the man. Indeed, the village’s people -his friends, his family, people he new for many years, literally turned their backs on him and went inside the warm thatch of their homes. Forgiveness would not come easy. If at all. The man reached his own home, now empty and desolate without a woman’s attention. He cooked and served his own meal and intended to sleep through the night before speaking with the village elders in the morning. But morning wouldn’t wait. The shout from village center saw to that. More shouts. Demands that he come out. Knowing this wouldn’t go the way he’d hoped, the man gathered the things he entered with in haste and kicked out the back wall of the house. His intent was to steal off in the night yet again, this time not to return with the hope of a forgiveness that now seems impossible. that it was a projectile point that lacerated the left subclavian artery, and that the attempted removal of the arrow at the time of death may have caused Ötzi to bleed to death. The projectile has long been known about, but, until now, the actual cause of death has been speculative. Ötzi’s movements in the last day or two of his life are confirmed by analysis of ingesta and pollen samples. He, apparently ate two different meals since he had two different kinds of meat in his digestive system that were at different stages of digestion and pollen samples could be forensically traced to specific regions near the site of his death. Specifically, Ötzi was in a subalpine region some distance above the Schnals and/or Etsch valleys where he walked to and was present about 9-12 hours before his death. 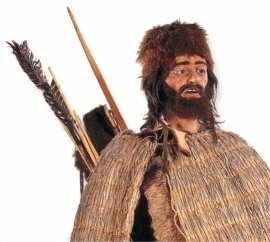 Seven to four hours later, Ötzi was again in a subalpine coniferous forest where he consumed his last meal and then he climbed to the Tisen Pass where he died. Basically, he was in the highlands, went down to the valley, and then back up to the highlands again in a matter of hours. His last hours were both hectic and violent. Where he was, what he ate, and the shot in the back of the shoulder with an arrow are all things that can be forensically revealed. Why he was where he was and why he was shot, to those questions we can only speculate. But sometimes, as long as we don’t attempt to establish them as truths, speculations can be the fun parts of archaeology. Oeggl, K., et al (2007). The reconstruction of the last itinerary of “Ötzi “, the Neolithic Iceman, by pollen analyses from sequentially sampled gut extracts. Quaternary Sciences Review, article in press. Pernter, P. et al (2007). Radiologic proof for the Iceman’s cause of death (ca. 5,300 BP), Journal of Archaeological Sciences, article in press. depends on how bad the austrians need to claim “Otzi” as their own. The Vinshagua valley was the last resting place of the ice man, which is presently part of an Italian national park.